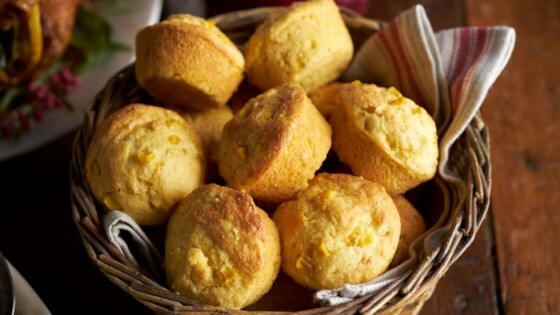 "Creamed corn and whole corn kernels bake up moist and sweet in this easy cornbread recipe using corn muffin mix  enjoy as muffins or squares with anything from chili to holiday meals." Preheat oven to 400 degrees F. Coat a glass or metal 9-inch square baking dish with non-stick cooking spray. For Bacon & Onion Cornbread, stir 1/2 cup chopped cooked bacon and 1/4 cup sliced green onions into batter before baking.